Heavily favored Dream Tree ran her unbeaten skein to four as she demolished five rival sophomore fillies in Sunday's Grade II, $200,000 Las Virgenes Stakes, winning by 3 ¾ lengths under Drayden Van Dyke. Conditioned by Bob Baffert, the 3-year-old daughter of Uncle Mo got a flat mile over Santa Anita's main track in 1:39.45. Third, about six lengths off the lead while in-hand at the half mile pole, Dream Tree cruised into contention around the far turn, easily overtook her stablemate Thirteen Squared at the top of the lane and easily held sway over a late running Exuberance at the wire. “I was trying to be patient because I felt we were kind of going a little quick and we were for this track,” said Van Dyke. “We've been working on her in the mornings and it's worked out. I've been able to get her to relax and finish well, so what else could you ask for? A winner of the Grade I, 1 1/16 miles Starlet Stakes at Los Alamitos Dec. 9, Dream Tree is now unbeaten in four starts. Off as the 1-5 favorite, she paid $2.60, $2.10 and $2.10. Owned by Phoenix Thoroughbred III, Dream Tree, who was purchased for $750,000 at a 2-year-old in training sale this past March, picked up $120,000 for the win, boosting her earnings to $390,000. Next to last with a quarter of a mile to run, Exuberance rallied well for the place, finishing a half length in front of Steph Being Steph. Off at 16-1 with Corey Nakatani, Exuberance paid $5.80 and $2.80. Fractions on the race were 23.22, 46.68, 1:11.73 and 1:25.16. Note: The winner picks up 10 Kentucky Oaks qualifying points, while the second, third and fourth place finishers were awarded four, two and one point(s) respectively. 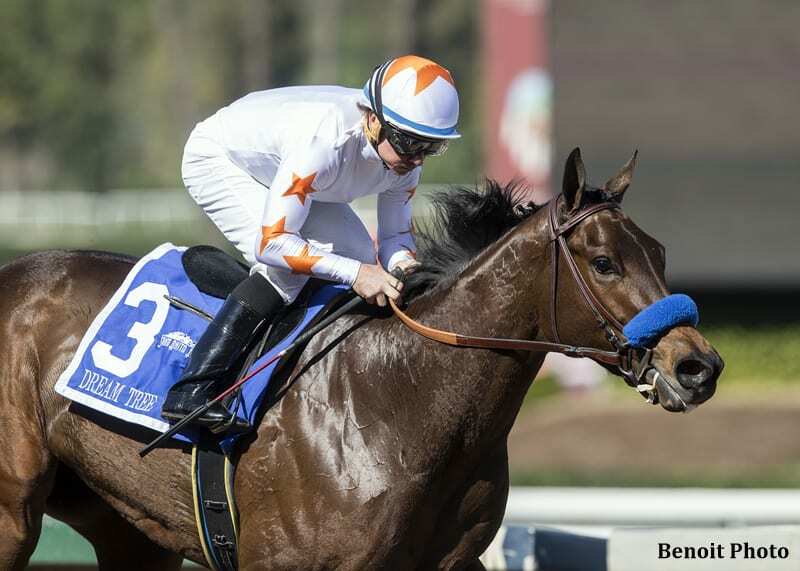 This entry was posted in NL Article, Racing and tagged Bob Baffert, drayden van dyke, dream tree, kentucky oaks, Las Virgenes, phoenix thoroughbreds, road to the kentucky oaks, santa anita, Santa Anita Oaks, santa anita park, starlet stakes, tom ludt, Uncle Mo by Mike Willman/Santa Anita. Bookmark the permalink.